More and more people decide to combine their township tour with spending the night in a township B&B or "township stay" after a township tour of Cape Town's Townships . For instance in Kopanong B&B ("Meeting Place"), situated in Khayelitsha. 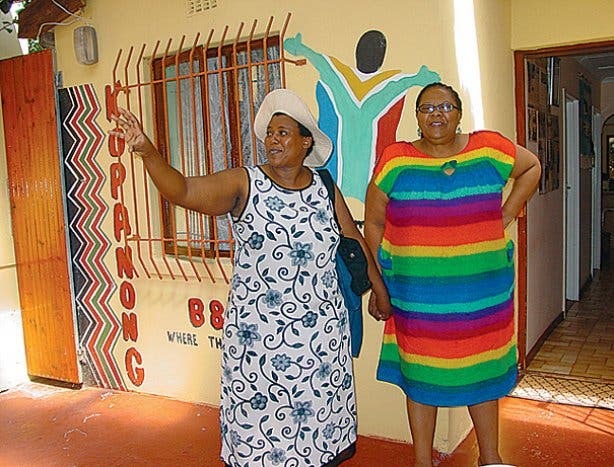 Kopanong B&B is run by Thope Lekau, a incredible strong woman who contributed her share to the struggle against Apartheid. In Kopanong, a Bed & Breakfast that consist of two rooms, she entertains visitors with food, drinks and stories of South Africa's history. Thope Lekau is an institution in Khayelitsha, and a great role model: In 1999 she won the Tygerberg Municipality Award for outstanding service in the hospitality industry. In 2001 she won a place in the final shortlist of the prestigious 2001 AA Travel Guides Accommodation Award Program with her B&B. "I decided to open a Bed & Breakfast because I wanted tourists to see and experience the townships, and be able to spend the night in our township. I wanted them to talk to people," Lekau explained after giving a grand tour of her establishment. "I was fed up that tourists saw Khayelitsha from behind glass, from the touring car. Khayelitsha isn't a zoo! I - after having the matter discussed with several tour operators - opened my doors for tea and lunch. And now, now I have a B&B!" Molo says: "More on townships in Cape Town and township tours to Guguletu , Khayelitsha or Langa can be found in our Things to do in the Cape Town Townships section or the Things to do in the townships at night." "I highly recommend sleeping a night in one of the Cape Town township Bed & Breakfasts such as Ma Neo in Langa Township in Langa or Vicky's Towhship B&B and Kopanong Bed & Breakfast in Khayelitsha township."